Egg-Free Kitchen | Recipes and tips for an egg-free diet. Egg-Free Kitchen Recipes and tips for an egg-free diet. 1 large aubergine (eggplant), sliced. It is not necessary to peel it. Mix the salt with water in a bowl, and soak the aubergine slices for 10 minutes to give them a milder flavour. Remove the slices from the water and dry them with a paper towel. Arrange them in a lightly oiled casserole dish, and place the tomato slices on top. Pour the sauce over the aubergine and tomatoes and cover with kitchen foil. Bake for 40-45 minutes at 220 degrees C (200 degrees C for fan ovens), or 425 degrees F. Sprinkle with Soy Parmesan or nutritional yeast flakes before serving. Serving suggestion: With fettuccine or wide flat noodles, green salad, and garlic bread. Rinse the lentils under running water. Place in a large pot with 2 quarts of water. Bring the mixture to a boil and simmer over medium heat for 20 minutes. The lentils will be almost tender. Add the vegetables, bouillon, garlic and black pepper. Stir gently and allow the mixture to simmer for 20 minutes more. The vegetables and lentils will both be tender. Add enough extra water so that all of the solids are well covered with liquid. Bring the mixture to a slow simmer, not a boil, as that will cause the dumplings to disintegrate. In a large bowl, combine the oil, egg replacer (if used), and milk until they are well blended. Add the flour, baking powder, salt, sugar and parsley flakes. Mix into a stiff batter. Set aside. When the stew is simmering slowly, drop the dough by small rounded teaspoons onto the vegetables. Cover the pot and let the dumplings simmer undisturbed for 20 minutes. No peeking. Serve the stew and dumplings as soon as possible. The stew will be thickened, and the dumplings will be light and fluffy. Combine flour, sugar, cocoa powder, baking powder and salt in a large bowl and mix thoroughly. Add the water, vegetable oil and vanilla; mix well into a smooth batter. Spread evenly in a 9×13-inch cake pan. Bake 25 to 30 minutes. Cool thoroughly before cutting into squares. There are many egg-free salad dressings, but the humble salad cream often contains eggs. Unfortunately all salad creams available at Tesco contain eggs as an ingredient. However there are some egg-free brands, such as the Asda Reduced Fat Salad Cream. As well as being egg-free, this is suitable for vegans and very good value. 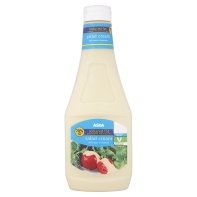 To find egg-free salad cream, look for brands that are whitish in colour as opposed to being slightly yellow. Also look at the cheaper brands, as the more expensive ones all seem to contain egg.